1. Even you surrender, you have to work on the modalities and the timetables and what have you, so negotiations will take place. The word even, as used here, is a focusing adverb, similar to only, also, and too. In speech, focusing adverbs are commonly marked by stress (CGEL p. 589), and even commonly comes directly before words such as though, if, when, and as. These prepositions1 are rarely stressed. This talk by Barry Schwartz provides a good example. The waveform graph shows the string even if it, with each peak corresponding to a vowel. Figure 1. Wave form of even if with audio. I study hard / and I’m a good learner / so even if I make a mistake / I don’t give up. Read it once all the way through, and then repeat it, pausing where indicated by the slash. You should read it in a natural speaking style or even a little quickly, not slowly and carefully. Allow students to consult with each other before asking how many, initially at least, omitted if. Point out that even is an adverb functioning as a modifier of if I make a mistake; it can’t join a clause or take a complement of any kind. A trip to a good learner dictionary’s entry for even (or here for an open source option) would be a good follow up. It’s also worth considering the differences in grammar and stress between, even if I make a mistake, I don’t give up, where even is modifying the phrase if I make a mistake, and even I /the teachers make mistakes, where even is modifying the NPs2 I and the teacher. 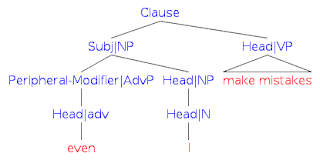 If you like syntax trees or sentence diagrams, you might find the following interesting, but don’t just drop them on your students. Notice that in figures 2 and 4, each node except the top clause is labeled with both a function and a category. Figure 2. 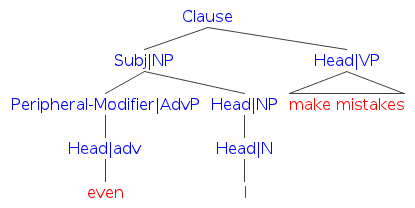 Modern syntax tree of even if I make mistakes, I don’t give up. Figure 3. Traditional Reed-Kellogg diagram of even if I make a mistake, I don’t give up. Figure 4. Modern syntax tree of even I make mistakes. Figure 5. Traditional RK diagram of even I make mistakes. 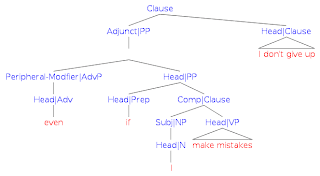 Notice that traditional grammar doesn’t allow for adverbs to modify NPs like I, so in figure 5, even in even I make mistakes must be modifying the verb as adverbs can’t modify pronouns and traditional grammar has no concept of noun phrase (NP). or simply as conjunctions as in the Oxford English Dictionary. But the modern approach characterized by the Cambridge Grammar of the English Language takes them to be prepositions, albeit prepositions taking clausal complements. One reason for this change is that typical preposition phrases are commonly modified by even (e.g., even in summer she wore wool), but the central adverbs ending in –ly usually reject modification by even (e.g., *he ran even quickly). As we saw last time, adverbs rarely modify individual nouns, but it’s not so unusual for focus adverbs like even to modify entire noun phrases (e.g., only the teachers). 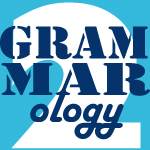 Modern grammar takes pronouns such as I to be both the head and the single member of a one-word NP. Once again, my thanks to Marianne Vespry and Randy Alexander for comments on previous versions! This brings out the idea that you can’t analyze grammar by looking at writing alone; you need to include speaking and listening in order to understand the root cause of the error and provide effective strategies. Even you do that, it’s not guaranteed to succeed! Good point, Derrick! The problem here does appear, superficially at least, to have its root in listening.